Intelligent people refuse to believe everything they hear or read. They are constantly questioning beliefs, ideas, tradition — anything they can find another side to. They apply deep critical thinking skills to form their own opinions and read between the lines. They are able to see through lies and charades to figure out what’s really going on. Highly intelligent people stick to their beliefs and they follow their own path in life, constantly on the hunt for knowledge. A highly intelligent person knows that his or her thoughts and ideas mean little if he or she isn’t willing to act on them. Half of the fun is bringing new, exciting and different ideas to light. They are constantly conjuring up plans in order to achieve their goals. They don’t just learn, they apply their knowledge whenever possible. They aren’t afraid to share their knowledge and their ideas with others. 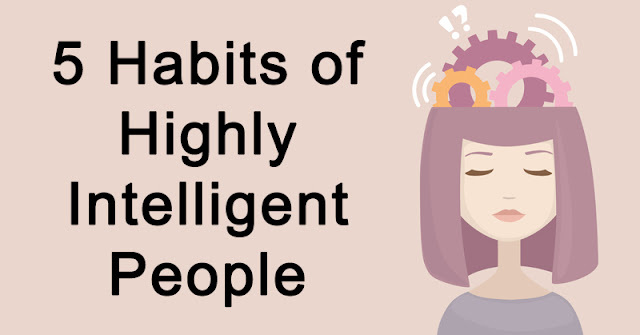 It may seem that highly intelligent people are constantly learning and doing, but the truth is, they know when they need downtime. They value quiet time to reflect and re-charge. They spend a lot of time alone with their thoughts, quietly planning. Highly intelligent people know that it’s important to get away from the hustle and bustle every once in a while to rejuvenate mind, body and soul. They know that self-love and self-peace are key to happiness.